One variety of Dachshund is the wirehaired. Since I have already discussed the smooth coat and the long haired Dachshunds, I thought I would touch upon the wirehaired variety of Dachshund today. The wirehaired is the least commonly seen coat in the US. 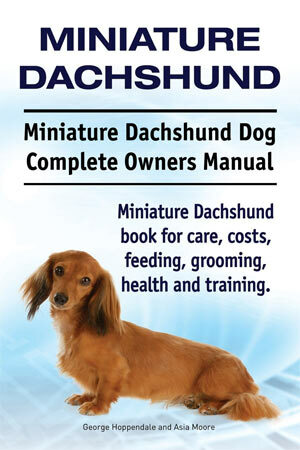 This type of Dachshund is the most common in Germany. 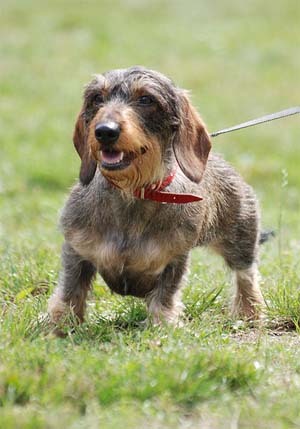 It is believed that smooth coated Dachshunds were crossed with various hard-coated terriers and wirehaired pinschers to produce the wirehaired Dachshund. Where the long haired Dachshund is the ultimate display of elegance, the wire haired Dachshund is the picture of hound and terrier types looking dapper and daunting with their wire hair. Their impish look lets you know they are ready to romp and dig outside if you’d like. Their coats provide the best protection outdoors out of all the Dachshund varieties. While their face, accented with their beards and eyebrows, may make them appear as a wise old sage, or perhaps a professor, their personality is often spunky, mischievous and even clownish. The coat of the wirehaired should be uniformly tight, thick and short. There is a hard outer coat and a shorter and softer undercoat. Their hair should not be curly, wavy or sticking up in all different directions. Though their ears are almost smooth, they do sport a distinguished looking beard and eyebrows. Their hair should not be long so regular grooming is a must! 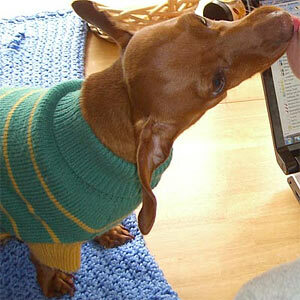 Hair should be short enough to retain the sleek body outline of the smooth coat Dachshund. Wirehairs should be brushed or combed at least once a week.